Did you know, Melbourne is home to more than half of Australia's top 20 technology companies and produces more ICT graduates than any other Australian city? It has the country's biggest pipeline of fresh ICT talent. With 37 per cent of Australia’s digital tech graduates, compared to 28 per cent in NSW and 19 per cent in Queensland, Victoria is well placed to deliver the next generation of the digital tech workforce. Well, things just got better. 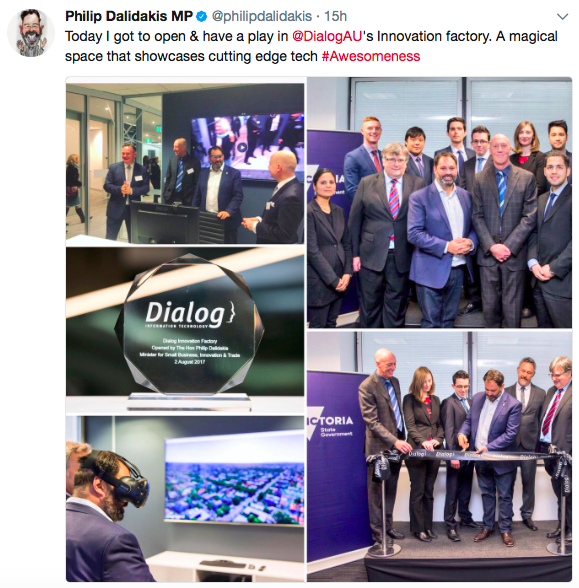 Last week, together with our proud parent Dialog Information Technology (Dialog), we celebrated the opening of a new hub for technology development and quality assurance and testing – the Innovation Factory - that will create an additional 200 jobs in Melbourne including 30 new graduate positions to be filled by students from local universities. Minister for Small Business, Innovation and Trade, Philip Dalidakis cut the ribbon and greeted the first intake of fifteen graduate recruits, pictured above, as they begin their journey. The Minister and guests enjoyed a showcase of Customer Insight research techniques including eye tracking and accessibility technology plus robotics and virtual reality on display. The hub will focus on current and emerging technologies in web applications, digital marketing, cyber security, social media integration, mobile, data analytics and cloud computing. The Victorian government is very supportive. To choose Victoria to expand their workforce by 200 jobs is a huge vote of confidence in the growing talent pool that our local tech sector is producing. Looking back through the models and frameworks applied to quality over the years, both within information technology and within manufacturing, there’s one common theme; they all begin with the Voice of the Customer. In all cases, where quality matters, one of the primary inputs is the customers' view. It’s critical that the same be applied to digital products and services. This forms a linchpin of the Innovation Factory, a place designed as a highly collaborative facility with active listening posts pinned to citizen needs and desires, a hub where we can involve customers directly in the user research and design thinking activities leading to experimentation. Graduate recruitment is a key component of the strategy. The past 5 years have highlighted how difficult it is to find talented technical people with critical thinking ability, great communication skills and EQ. We know from experience that some of the most successful and well-respected consultants at AccessHQ had historically come through previous graduate intakes. An underlying driver is the belief that people with genuine life experience outside the work environment are better able to adapt to the dynamic and challenging nature of consulting. The Innovation Factory provides a great environment in which to employ, coach and mentor the next wave of the digital tech workforce. To arrange a walk-through of the Innovation Factory or an interactive demonstration of the technologies in use, I’ll be more than happy to help you with that; just let me know. You can find out more about the Graduate Recruitment Programme here. And, while you’re here, learn more About Us and our parent company Dialog.